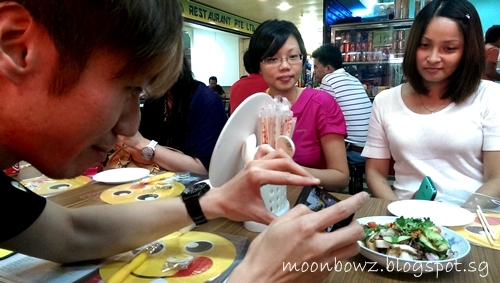 After attending the opening ceremony of Singapore International Jewelry Expo 2013, I had to rush to my first official Food Tasting session by OpenRice (previous Food Tasting is an “exclusive” event, which I will probably blog in another post :X). This is not my first time eating Burmese Food. Thanks to SE and TZ, I got to ate a few Burmese lunch at Peninsula Plaza from a few different stalls. 🙂 So I am all in for Burmese Food. In life, always expect the unexpected. Previously since I am the one ordering my food, I tend to order anything that looks “safe” to me. This round, I do not get to choose my own food, so guess what I got to taste? Although it is instructed to cook less spicy, it’s still too spicy for me! 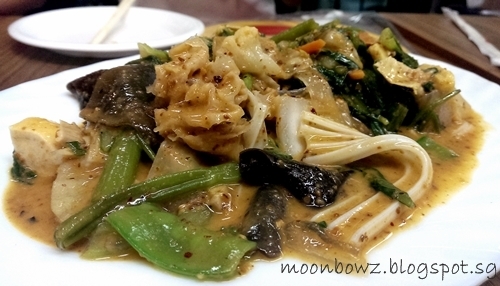 The gravy is not too thick and the vegetables are nicely cooked. 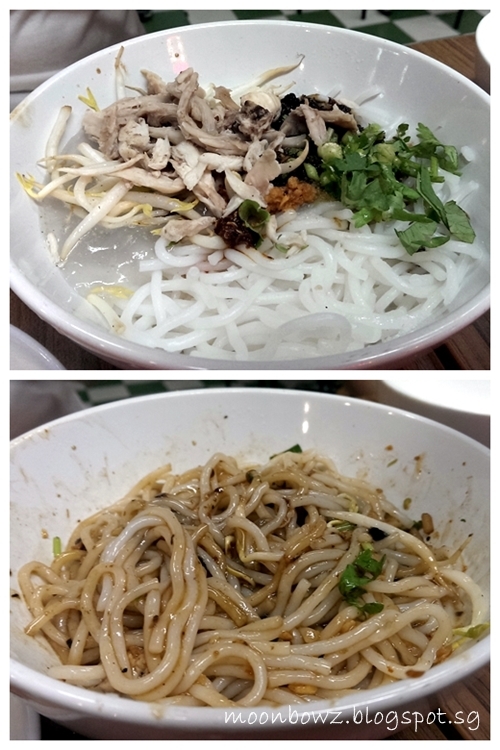 The thin flat grass noodle are too chewy to my liking – but it’s just a few strand of them =). The serving is big for the price – one value-for-money dish. 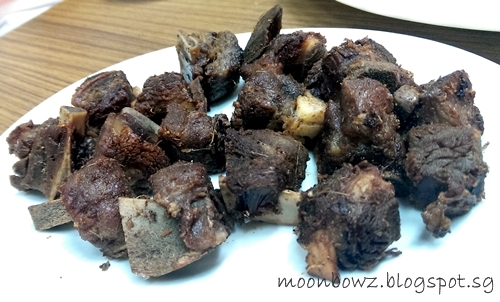 It looks like overcook meat chunks to me when served – initially I was a bit worried that it’s beef. However, to my surprise, the small chunks of pork ribs is cook such that it allow me to removed the bones easily and it is crispy & yummy~ It’s appearance is definitely not giving justice to it’s taste. It’s give me the feeling of eating thai salad with roasted pork. 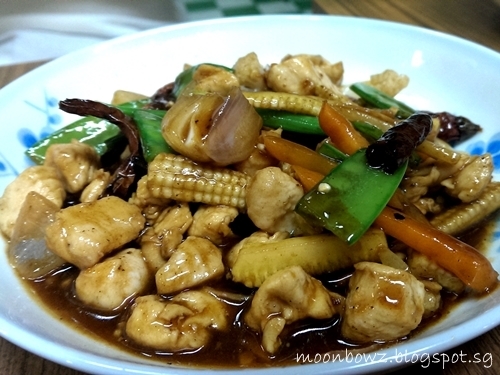 Refreshing & SPICY & crispy – the spicy level give me a ‘shiok’ feeling, but yet not too uncomfortable for me to eat. Comparing it with the chinese version of Kong Pao Chicken, I think the chicken is not spicy enough and the taste is too mild for my liking. 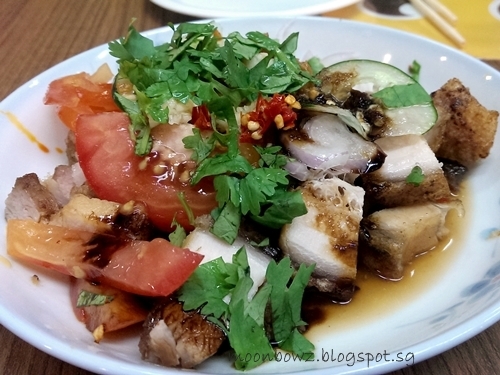 It taste similar to those “chicken rice soup” served when we ordered hainanese chicken rice. I was caught by surprise that it’s spicy since it looks pretty clear to me. 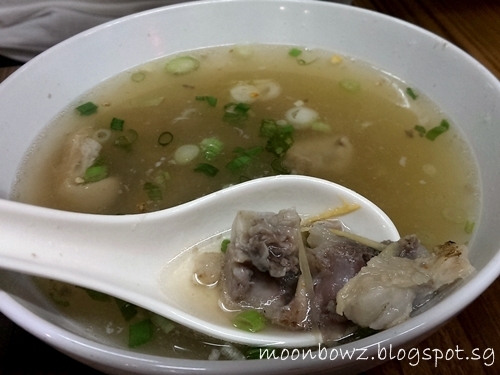 =) It’s a bit more oily compare Pork Legs Soup. 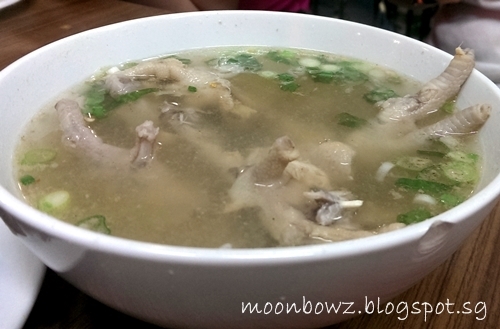 It taste similar to the chicken leg soup but served with small chunks of pork knuckles meat instead and comparably less spicy. I am not a fan of pork knuckles but they are quite chewy. It taste like noodles with soybean paste (炸酱面) to me. It’s served with the thick rice noodles, chicken, bean spout and with some gravy hidden under the rice noodle, mixed them well before eating. I personally like the chewy thick rice noodle. This is a MUST ORDER dish! If you ever come here to eat, remember to order this dish. With a bit of sesame sprinkle on top of the refreshing and not too rich peanut sauce, I fall in love with this freshly steam fish which is cooked just right. I have to say the Steam Fish is SUPER VALUE FOR MONEY! I love the freshness, the special gravy and the price!